The Ultimaker2 doesn't need a whole lot of maintenance but that doesn't mean you should neglect it. This guide will talk about some basic maintenance and other tips to keep your printer happy in the long run and prevent bigger issues down the line. When you switch between filaments it isn't uncommon for the filament to be a bit stubborn and wanting to jump off the spool. It is also quite common that the end of the filament tucks itself under the coils on the spool. The latter can be a pain as it will more than likely cause the filament to not unspool cleanly and jam things up. Avoid both scenarios by simply grabbing and holding on to the and of the filament as you pull it out of the printer. All spools will have one or more holes around the edge, stick the end of the filament through one of these holes before you let go. If the end of the filament accidentally manages to get itself tucked into one of the other loops on the spool try to take care of it right away. If you can, unload filament from the spool until the tangle is off the spool and handle it from there. When the end of the filament goes under another loop it has a tendency to keep moving down further into the spool as you unload filament. If you get it sorted right away as it happens you can save yourself some head aches. Greasy fingerprints are a big no no when it comes to platform adhesion. The plastic will not be able to stick which can lead to the print coming off the platform too soon. Thankfully it is easy to clean the glass bed. 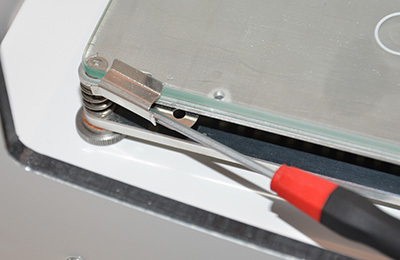 Unclip it from the platform (we recommend using a tool such as a screw driver to lever the clips out of the way as they can be sharp) and then simply wash it with hot water and some dish soap. Dry it off and put on a fresh layer of glue. The part of the machine that sees the most movement by far is of course the sliding blocks. To keep them moving smoothly on the rods it's recommended to keep them oiled with a light machine oil such as sewing machine oil. A single drop per axis is plenty. How often you need to re-apply the oil depends on how much use the printer gets. With the printer powered off you can move the print head around with your hand. If you feel more resistance than usual it might be time to give the printer a bit more oil. 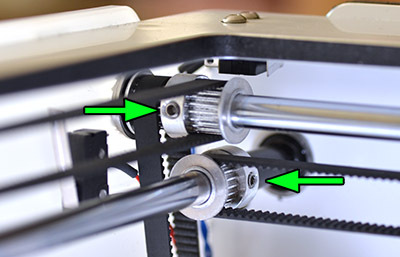 Do not apply oil to the thicker Z-axis rods (the rods that the bed rides up and down on). This can cause the bearings to bind. 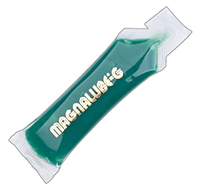 The screw that drives the bed up and down is lubricated using the green lube that was supplied with your printer. The screw should have been greased during assembly and rarely needs additional grease. That said, if the screw looks dry it's a good idea to give it a bit more grease. Apply a few small beads of grease along the screw and then manually move the bed up and down a few times to distribute the grease. You can do this either manually by grabbing the bed at the back of the printer and lifting/pushing. Or you could do it via the maintenance menu on the printer: Maintenance -> Advanced -> Raise buildplate. If the platform feels very stiff or is binding when you move it, it could be that the linear bearings are not properly aligned. This can be fixed by removing the white cover (two screws hold it in place from underneath), loosening the screws that hold the bearings in place, moving the bed up and down to allow the bearings to self align, tighten a screw or two and then repeat until done. This is very rare however. If you are not experiencing issues with your prints this is likely not necessary but after you've first gotten your printer and had it run for a number of hours it can be a good idea to just make sure they are tight (similarly to when you change tires on your car). Power the machine off so that you can move the print head around manually. This way it's easy to spin the pulleys into the correct orientation for you to reach the screws. A sign of loose pulleys is a leaning print or a print where the layers suddenly shift out of alignment. More about that here. It's a good idea to periodically clean the knurled sleeve of the feeder (the round bit that drives the filament forward). It can start collecting plastic dust which decreases its grip on the filament. Usually it's enough to simply blow any residue off but you can also use something like a tooth brush to reach in there and clean it. If you want to be really thorough you can disassemble the feeder so that you get full access. 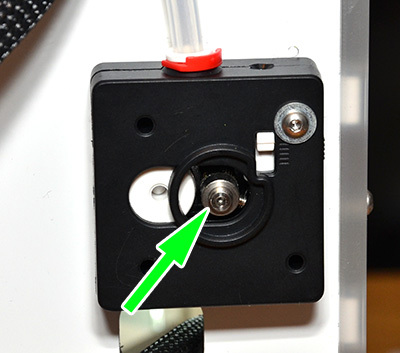 This is especially important to do if you have had a filament grind. Make sure you do it right away after it happens or you'll likely have it happen again on the very next print. This shouldn't have to be said but try to keep things clean. No machine likes being dirty. 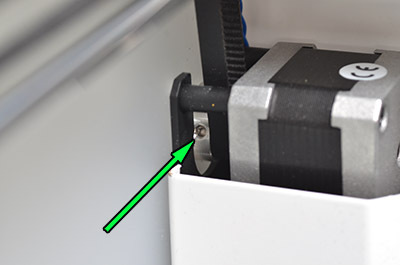 Make sure that no scrap PLA gets into the z-screw to cause trouble for example. Check that the fans aren't clogged up with dust and left over filament. Check that belts don't have stray pieces of plastic on them and so on. It's also a good idea to make sure your filament is clean so that the nozzle doesn't get clogged by dust, pet fur or other debris. Remember, the exit on the nozzle is a mere 0.4mm in diameter. If your spools of filament get a lot of dust of them you might consider adding a dust filter just before the feeder. This can be something as simple as a pipe cleaner wrapped around the filament. There are also filters that you can print, this is one alternative but there are many others. The best thing is to avoid having to use it in the first place of course. The most commonly used slicer software for Ultimakers is cura. This software is constantly being improved and worked on so it's a good idea to keep an eye on it. New versions of the firmware will also ship with this software and the program will assist you in updating your printer. As with most software out there, the latest isn't always the greatest. Like with all software out there, bugs do appear so when a new version gets released you might want to wait a while, just in case. If bugs are found they will most likely be reported over at the Ultimaker forums (which is a great resource for everything regarding Ultimaker, you should check it out).